Did you just copy and paste the goblin image from Oots? Fred: Oh no! We're surrounded by goblins! Bob: More importantly, we're STILL in the comic. Fred: So, uh, what will we do now? Bob: We'll kill all the goblins! Fred: Are you mad? 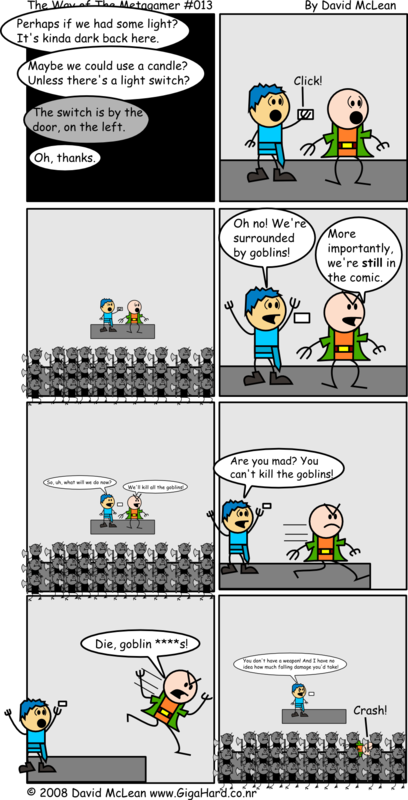 You can't kill the goblins! Fred: You don't have a weapon! And I have no idea how much falling damage you'd take!